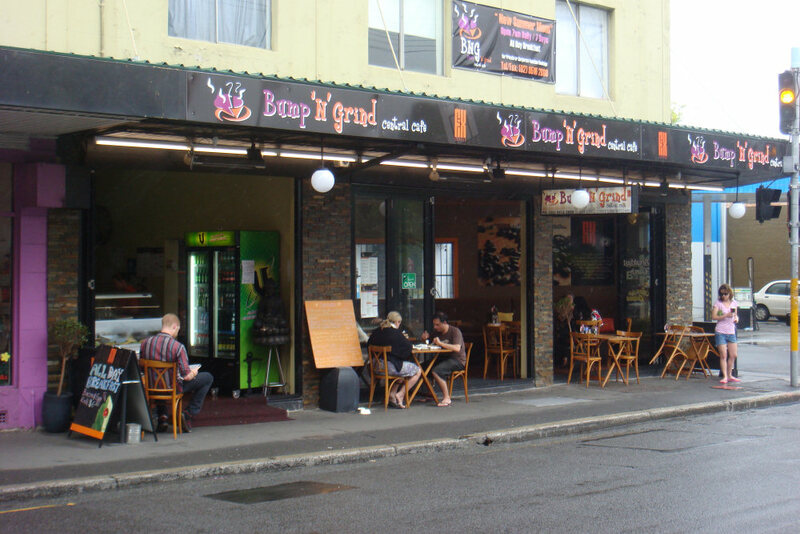 Bright, clean and vibrant were our initial thoughts on entering Bump N Grind Central Cafe in Newtown. The music is courtesy of V on an LCD television, the waitresses were quick and attentive. Luckily we made it just in time before the 11:30 rush hour. Most patrons were young couples and our hopes were high as we watched their hot breakfasts coming out of the kitchen. Our first disappointment was the tea. Being from T2 we knew that we could expect some good quality tea however it’s preparation was poor. The over steeped leaves made it bitter and undrinkable. Both the green and English Breakfast teas ($4 each) were served in Bodum coffee plungers that may have been left on the order counter for too long. This is pure sacrilidge for tea drinkers and the tea cups remained untouched on the table. At the end of our visit we spoke to the manager on duty about this but he seemed disinterested in our points saying that no-one else ever pointed this out and he hadn’t experienced this problem before (implying we didn’t know what we were talking about). 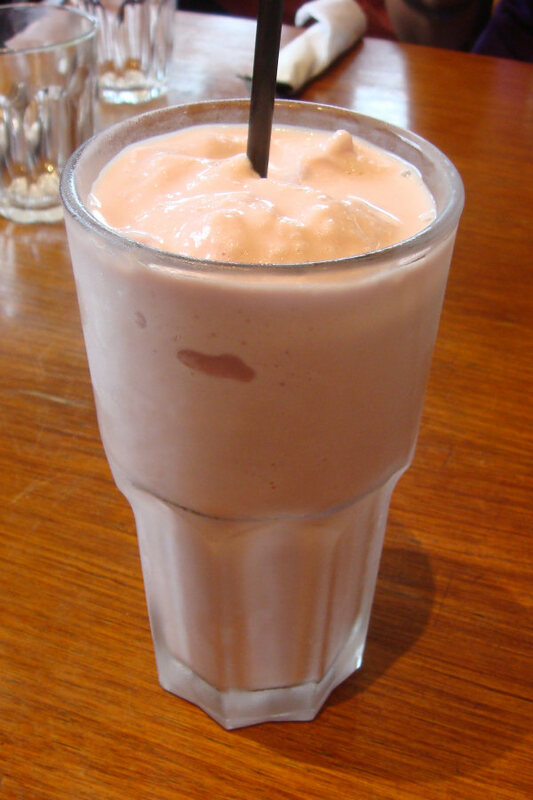 The strawberry smoothie ($6) was very thick… almost like a milkshake in that it contained too much milk and ice-cream for our liking. 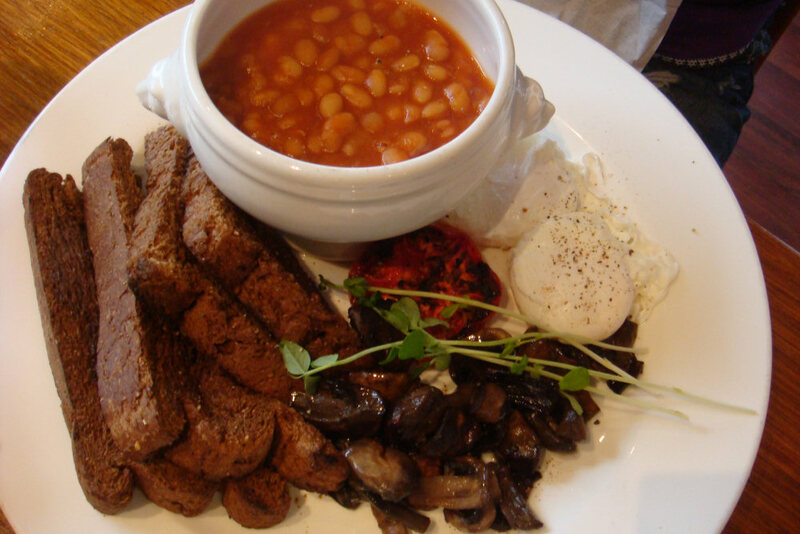 The brunch platter ($10.50) is described as being “served with grilled cheese, tomato, croissant and a fresh fruit salad”. 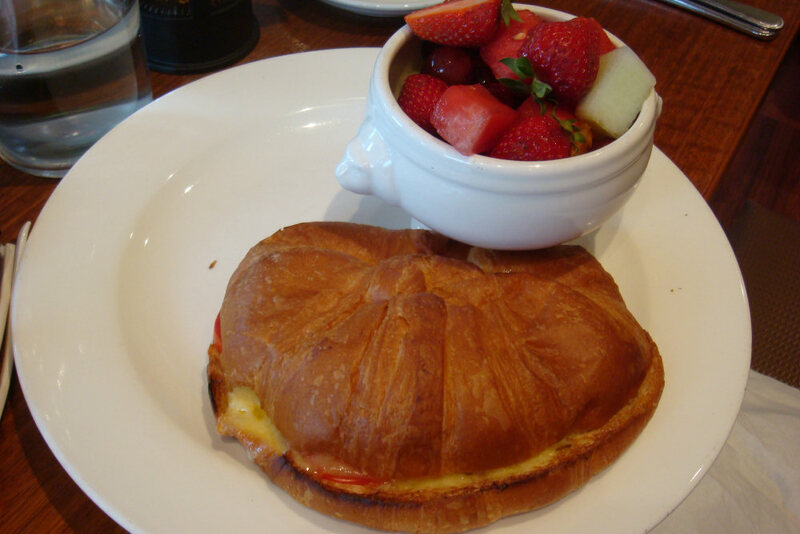 We found out that this translates to a grilled cheese and tomato croissant with a fresh fruit salad. The resulting ‘platter’ was a bit barren but points for creativity. It is nice to have a unique dish with well paired ingredients. 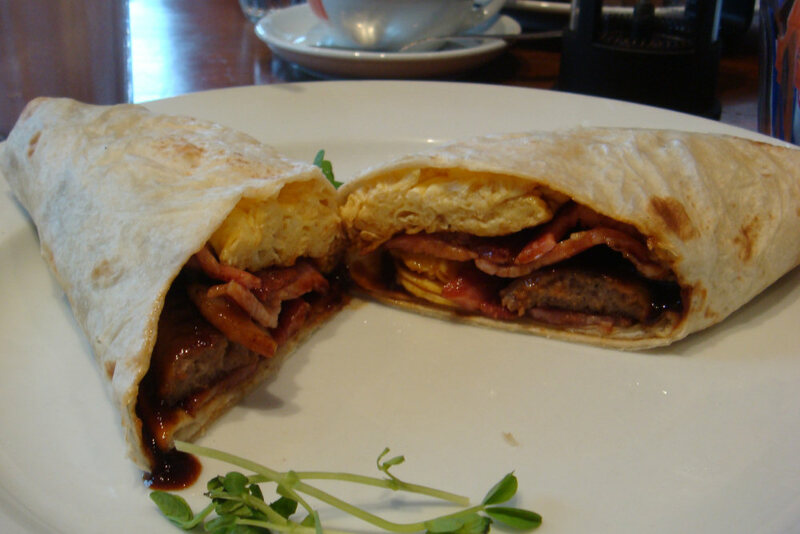 The breakfast wrap ($11.50) contains all of the ingredients of a hot breakfast. Scrambled eggs, bacon, sausage and “inhouse BBQ sauce” in a tortilla. The result was an easy to eat (with hands or cutlery), filling meal that was cooked very well. The sausages were a bit plain and reminded us of ‘snags’ that would be thrown onto a BBQ. Something a bit more unique would be an improvement. 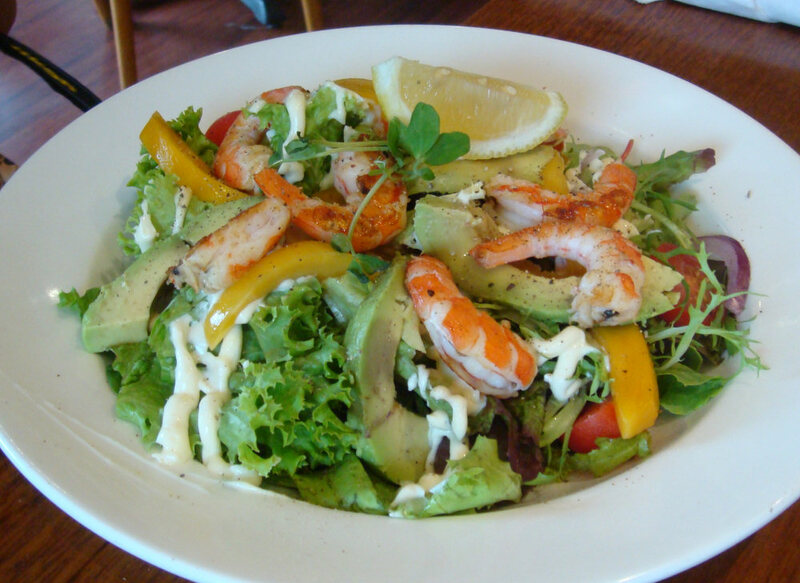 The person ordering the tiger prawn, avocado and mango salad ($16.50) chose this dish because she does not like mayonnaise or creamy dressings and it is described as having a “tangy mango dressing”. The dressing did not match it’s description in the slightest. It turned out to be plain mayonnaise. Not even a dressing; plain mayonnaise. Not even a secret sauce mayonnaise; just plain mayonnaise. Upon reaching the end of the dish we also found that it had also been too liberally added. This also required a follow up with the wait staff where we were told that this was the chef’s first day and the ‘dressing’ had been a mistake. We spotted the same dish coming from the kitchen later again with mayonnaise. We were offered a 10% discount but the disappointing mayonnaise/mango combination and the great tea debacle spoiled the visit for some of us. 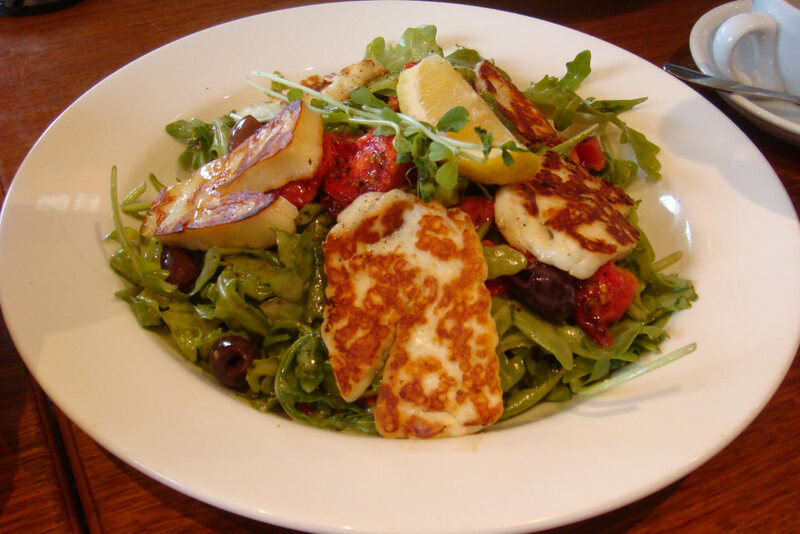 The next salad was grilled halloumi and tomato ($14) which comprised of rocket, roasted tomato, kallamata olives and a lemon herb dressing. Although fantastically presented it became a contentious point. Half of our table liked the tanginess of the dressing, the other half found it too flavourless and oily. We could all agree however that there was too much of it. The salad was drowned and the rocket below the outer layer of the salad was limp and unappetising. 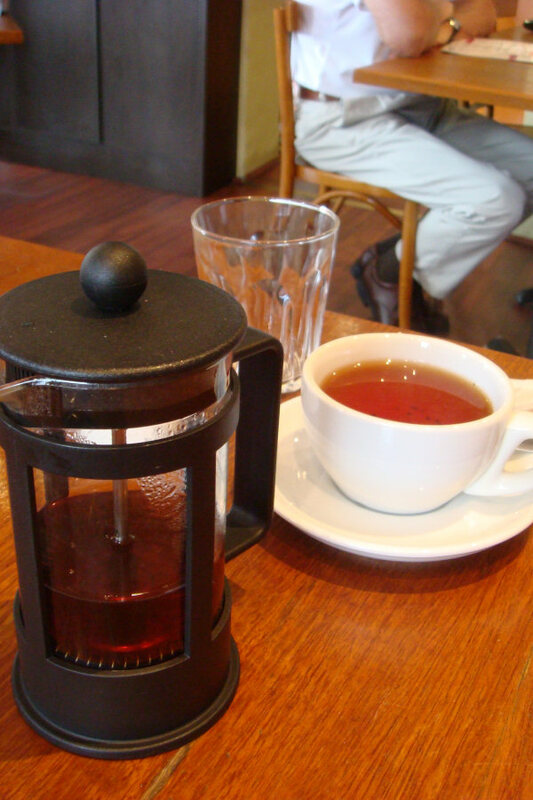 We came away from this café with mixed reactions. The lack of interest from the manager to his customers’ questions was off-putting. What can be positively said is that the hot dishes were well prepared. The eggs benedict on other tables looked stunning and upon questioning other patrons, they were enjoying their hot breakfasts. May we suggest staying away from the tea. Cold drinks on offer included fresh squeezed orange, apple, pineapple, carrot, celery watermelon or ginger ($6), frappes (peach, strawberry or tropical, $5) freezoccinos and many more.